During a space mission, astronauts conduct tasks for which they have trained for months. They work with equipment in which large amounts of time, money and effort have been invested. When a job has that much riding on it, a person cannot afford to call in sick. It’s the role of NASA’s flight surgeons to make sure the astronauts do not have to do so. The flight surgeon’s job involves a variety of duties. These include providing medical care for astronauts and their families. Flight surgeons sit in Mission Control and talk with the astronauts in space. They perform annual medical exams of current and former astronauts. Flight surgeons provide medical training to shuttle and space station crews, evaluate medicines that may be useful in spaceflight, and more. Roden, for example, also works with aircraft operations, providing some of the same services for instructors and pilots of Johnson Space Center’s aircraft operations division. Flight surgeon Ed Powers explained that crewmembers receive extensive medical training so that they will be prepared for any problems that may arise during the flights. Even in an emergency that would require the crew to leave the station, it would be hours before they could receive help, so the astronauts are trained to deal with anything from a small cut to a heart attack. In addition to receiving classroom training, the astronauts can practice procedures at local hospitals. As training leaders, the flight surgeons frequently serve as guinea pigs: Letting astronauts learn their way around needles is one example. Powers, the deputy flight surgeon for STS-118, said the crews he has worked with have not had to use that training for major problems. “These crews are very healthy,” he said. In the unlikely event that a medical problem develops on the STS-118 mission, it has an advantage: Crewmember Dave Williams is a medical doctor. Not only do current astronauts have regular check-ups at the clinic, but former astronauts return to NASA once a year for a physical exam. The astronauts get free physicals, and NASA learns more about the long-term effects of spaceflight. During missions, a flight surgeon works in Mission Control and holds daily conferences with the astronauts. Unlike most NASA space-to-ground communications, these conferences are private. Flight surgeons do not report details of the conferences back to Mission Control. If they learn something that could affect the mission, they let the flight director know. As with many jobs at NASA, the flight surgeon job comes with its share of meetings. Flight surgeons meet weekly with medical boards to discuss the flight status of patients. The surgeons confer with representatives of other space agencies to discuss medical issues related to the International Space Station. They talk with the Space Radiation Group to analyze how upcoming space weather, such as solar flares, might affect crews. Recently, the flight surgeons have become involved in a new set of meetings — looking ahead to discuss medical issues that may arise when astronauts begin living on the moon. Powers and Roden are excellent examples of different ways people can end up working for NASA. Powers was really interested in science in high school, and earned bachelor’s and master’s degrees in biomedical engineering before attending medical school. He then continued his education with more post-graduate work. After becoming a certified emergency medicine specialist, he spent a year as an associate director of an emergency medicine department. 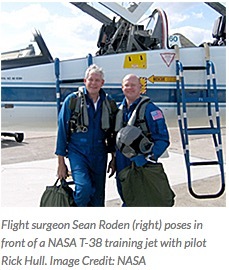 After more post-graduate experience in aerospace medicine, he became a NASA flight surgeon. However, after one year, he left the agency to work in clinical medicine to pay off student loans from his extensive schooling. He returned to being a flight surgeon in 2003, after 12 years in private practice. Roden, on the other hand, began his career as a professional cowboy. Working as a calf-roper in high school, he had no plans to go to college. After an injury ended that career, he planned to be a welder, but his father begged him to go to college. He went to college and found that he really enjoyed it, but was interested in too many things to choose one field for his major. Finally, Roden decided to become an emergency medical technician when a friend pointed out that, in the ambulance, “You’ll get to drive fast and run the siren.” That led him to medical school, and he quickly developed an interest in combining medicine and flight. When a friend told him about a flight surgeon training program, he jumped at the opportunity. — attracting and retaining students in science, technology, engineering and mathematics disciplines; strengthening NASA and the nation’s future workforce; and engaging Americans in NASA’s mission. To compete effectively for the minds, imaginations and career ambitions of America’s young people, NASA is focused on supporting formal and informal educators to engage and retain students in education efforts that encourage their pursuit of disciplines needed to achieve the Vision for Space Exploration.